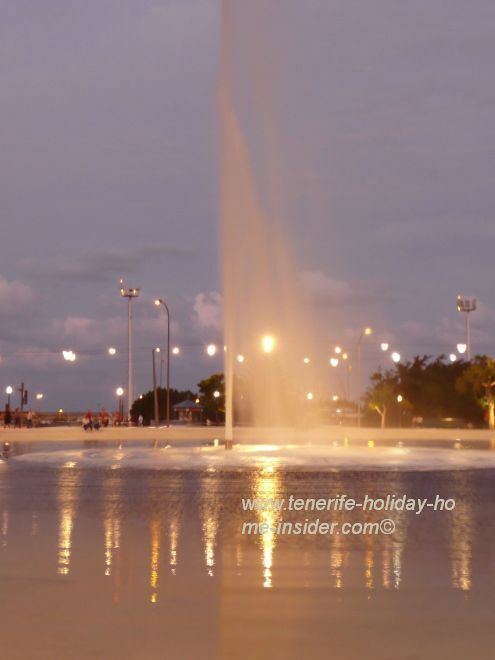 Any news about the Tenerife Plaza de Espana? Indeed, Plaza de Espana (written with ñ and tilde in Spanish) has hot news. Plaza de Espana biggest and most unique town square of the Canary Islands and most likely of Spain which is also called Plaza del Agua (Place of the water) designed by the Swiss architects Herzog and de Meuron is now in its last phase to be linked to the ocean. The works of the second phase which include a small museum under the lake with a few ancient walls of the fort were accomplished by the middle of 2017. 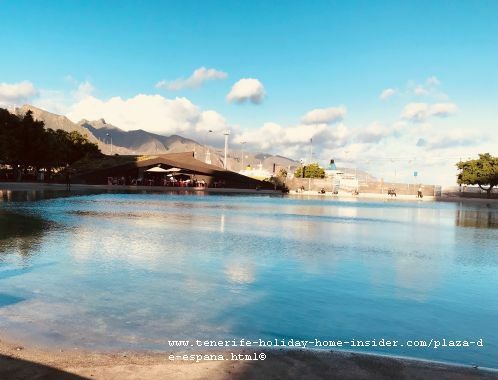 Now, final changes which will add new Tenerife capital tourist attractions like an aquarium have been in progress since 2018. First steps to remodel the square were taken already in 1929. Then the Fort Castillo de San Cristobal which took up an area that was about the size of today's lake at the Plaza was torn down, as it had become a 'useless eyesore' for many. Why? Pirate threats had stopped. However, the glorious victory over the Sea Admiral Nelson has lived on. He was the last who had tried to attack the ancient military complex from its land side. 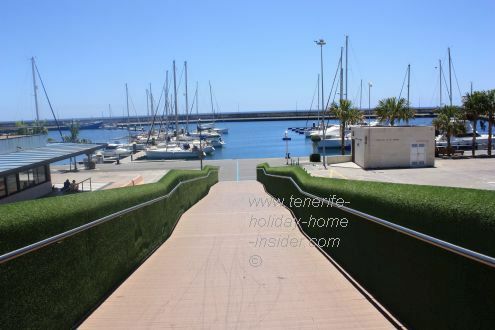 I found the seaside connection to the Marina that's depicted below cordoned off again when I visited the Plaza in November 2018. Plaza de Espana with previous land bridge oceanfront access of 2017. 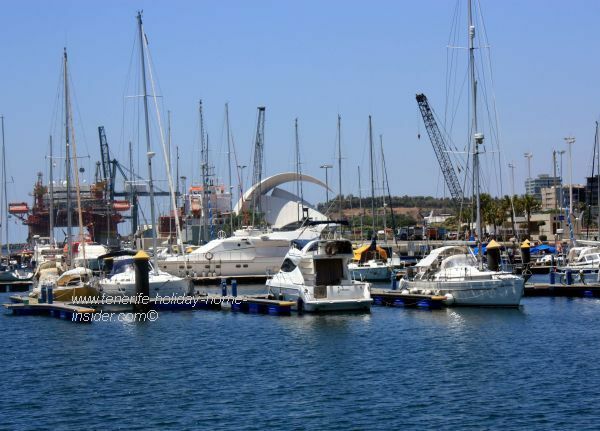 Before, the yacht harbor was opening up in front, once you were on the downward track. For time being you may only reach this Marina from opposite the Auditorium Adan Martin until all works will be done. 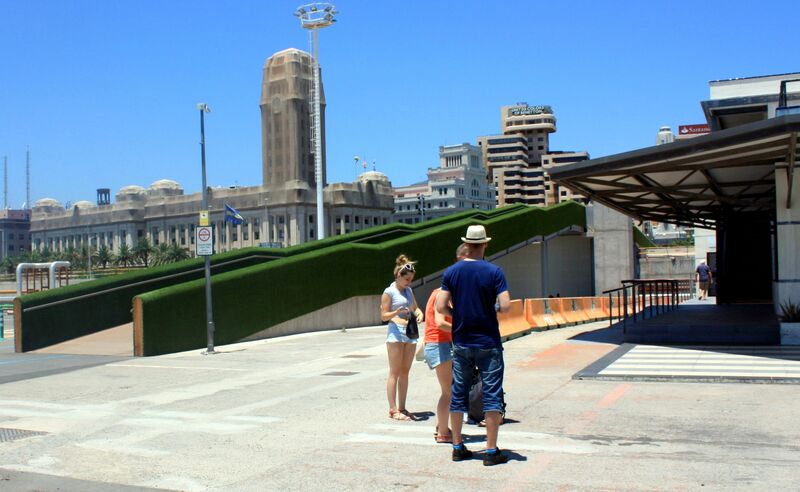 The future seaside access on the square? It will still be by the blue icon on the Google map where you find the Monument de Los Caidos (fallen soldiers) or the former Castillo de San Cristobal next to the "Tunnel". Also make out important buildings on the map. 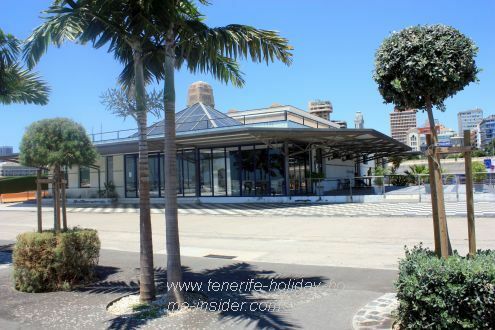 They are the Cabildo administration headquarters of Tenerife beside the Casino which is not a place to gamble but a cultural center. Then, there are the capital's main post and communication offices with a tall commercial building beside it. The monument of the Caidos by General Franco with an arched semi circle Colonnade stand in front of the Cabildo. How easy is it from there to get to the ocean? 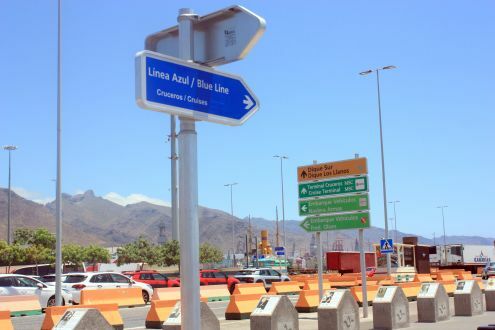 It will mean to simply cross what's now the Avenida de Anaga which will all be in an underground tunnel in this spot eventually. The tourism emblem Santa Cruz with large alphabetic letters and a green heart above its center stands in front of its artificial lake on Plaza España. 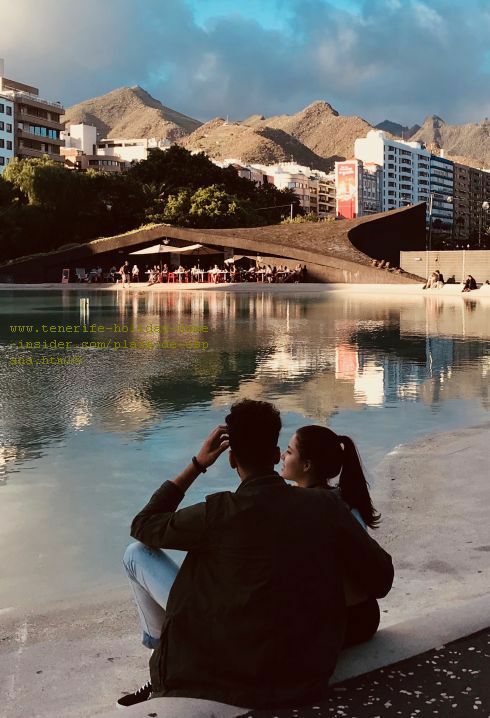 The most modern and unique town square of the Canary Islands and most likely in Spain. 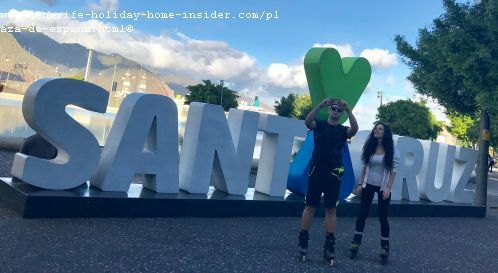 Mind that this so called Plaza del Agua has also become popular for the Roller skaters of the new millennium, as depicted above. British tourists by the newly opened up Santa Cruz seaside. Plaza Espana oceanfront landscaping with palms and green shrubs. Auditorio Adan Martin seen behind yacht harbor. Click for info about the seaside museum by tiny stone monuments. 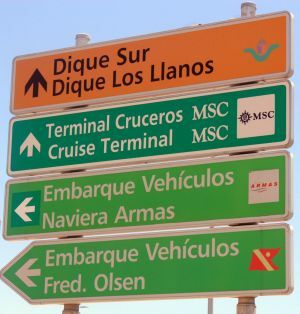 Getting to Tenerife cruisers or ferries, such as Fred Olsen or Navieras Armas. 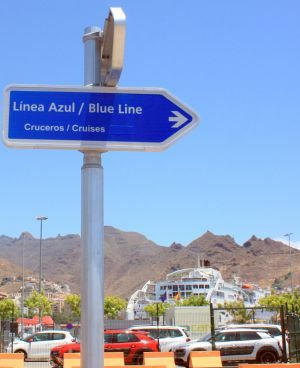 Important Cruiser passenger information Santa Cruz de Tenerife. 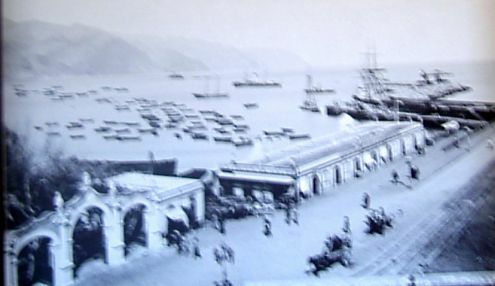 Plaza Espana with its occasional market square reached by the Alameda de Santa Helena Portal, visible in the background. What else is most unique with the city lake by Herzog and de Meuron? Modern landscaping with a living roof of flowers of both the Lake Cafe and tourist office whose system was invented by Patrick Blanc. The town square of yore and now. Now, all who arrive from cruise liners or with their own yachts will find literal cordial welcome written on the floor. 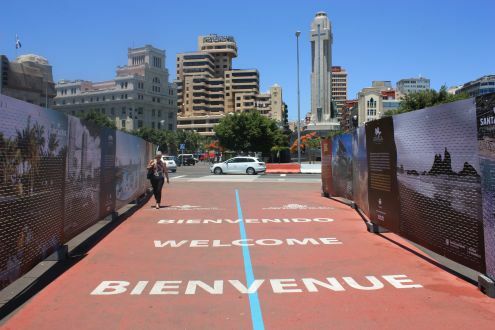 It will greet them when they enter the key to downtown shopping thrills and other surprises like the biggest Samba Carnival of Europa by the most innovative Spanish City yard the new Plaza de Espana in Santa Cruz de Tenerife. 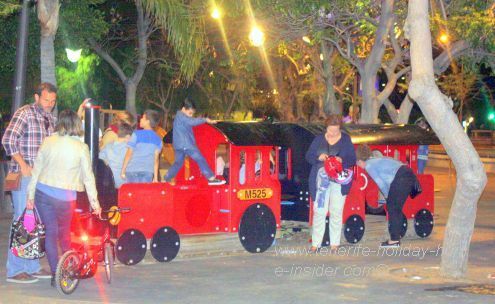 Welcome to downtown Santa Cruz with Tenerife's most important town square. 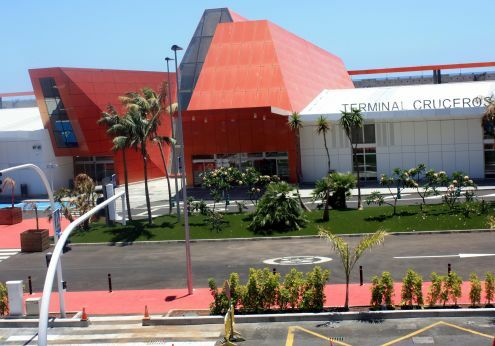 In fact now, you can walk all along the seaside from the Auditorium opera house as far as the new Cruiser terminal. 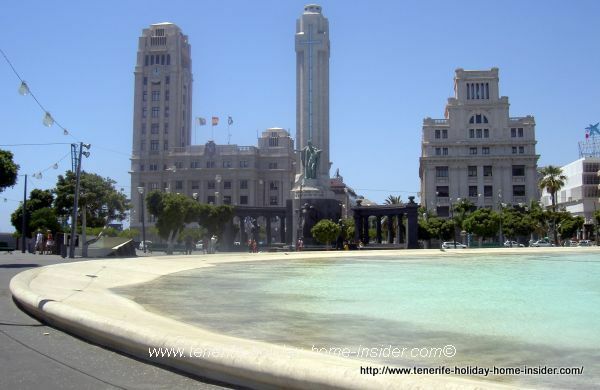 And sometime soon, you may stop over by the extraordinary Plaza de Espana an indisputable must see attraction of Tenerife Island. 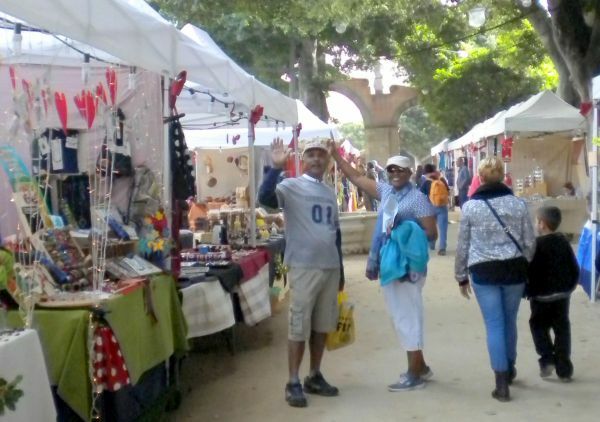 More top attractions by Plaza de Espana. 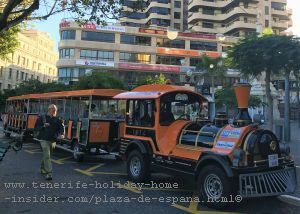 From Plaza de Espana back to Santa Cruz Tenerife capital. 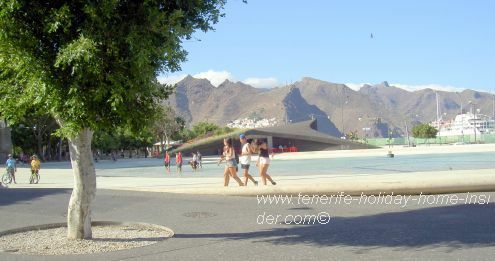 More information about the most modern and biggest town square of Tenerife and the Canary Islands here.